Turtles are one of many species that use their sense of Earth's magnetic field to navigate great distances. But the magnetic field is constantly drifting, and that can cause major confusion in such a long-lived species. Here's their ingenious solution. 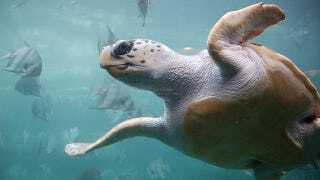 Species like the loggerhead turtle show incredibly fine-tuned understanding of the Earth's magnetic field. Born on the coast of Florida, the hatchlings will swim out to the open ocean and spend six to twelve years in a vast circular current called the North Atlantic Subtropical Gyre. During this time, they rely on their knowledge of magnetic north to remain inside the gyre. They, they head back to the Florida coast to breed, using their sense of magnetic north to navigate to the correct location. To figure out how the turtles use their magnetic sense to stay in the gyre, University of North Carolina researcher Ken Lohmann made hatchlings swim in waters that simulated what it was like to be just off the coast of Portugal, which is near one of the boundaries of the gyre. By placing magnetic fields around the water that mimicked Earth's magnetic field, the researchers could very closely chart how the turtles swam. When they were near the simulated north coast of Portugal, most of the turtles would swim south to remain in the gyre. But as they reached the southern coast, they changed course and started going southwest, even though continuing to swim south would have still kept them within the boundaries of the gyre. Lohmann thinks this is likely because the waters due south of that simulated location would be the shallow waters off northern Africa, which are full of predators dangerous to the loggerheads. Altogether, this suggests the turtles have extremely precise understanding of their position, which means they have a very deep knowledge of the Earth's magnetic field. While that's great for avoiding dangerous predators in the short-term, it does raise a difficult question - how do loggerhead turtles cope when the magnetic field shifts? The magnetic field can vary a significant amount each year, and that variance could seriously throw off the turtles' sense of direction. What's more, this isn't a species that can quickly correct its faulty magnetic sense with a couple new generations - these turtles can live for nearly 70 years, and a lot of turtles could get fatally lost over that sort of timescale. However, it seems that loggerheads have already evolved a most ingenious solution to this problem. Lohmann found that in all the simulations, a few of the hatchlings would always swim in the wrong direction, heading away from the gyre and into dangerous waters. These hatchlings must have a wildly malfunctioning sense of the magnetic field, and in the wild that would likely prove fatal. That might be exactly the point. Right now, the magnetic senses of these turtles are useless, perhaps fatally so. But if and when the magnetic field does suddenly shift, these turtles will suddenly have magnetic senses that are perfectly suited for the new order. Lohmann calls it an evolutionary insurance policy, a last-ditch way of making sure at least some turtles can survive even the most drastic shifts in the magnetic field. This also seems like the ready-made premise for an animated movie about a poor, plucky young turtle who gets cruelly mocked for his faulty magnetic sense but then leads all his former tormentors to safety...actually, please excuse me, I think I've got a screenplay to go write. Via New Scientist. Image by ukanda on Flickr.